Wow, this is so overdue! I first read about Vietnamese caramel sauce in Bittman's How to Cook Everything or Best Recipes in the World. I was very intrigued; I had never heard about it before. A while back, I tried it with prawns. It was a success! It was time to replicate it for a party setting. This time, trout acted as the protein. First, I mixed some nam pla (fish sauce) and water together. I made sure I had this ready so I could add it to the caramel to stop its cooking. 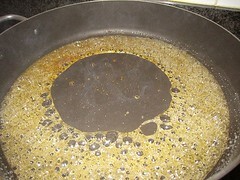 When the caramel reached the desired color, I quickly poured in the nam pla and water mixture. The caramel was mad and hissed at me. I ignored its hissy fit and added some shallots and ginger. I'm not sure if the ginger is traditional; it's a Chinese thing to add ginger to fish. I also added black pepper and lime juice. 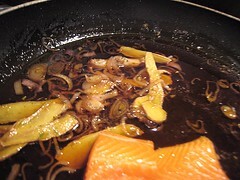 When the shallots softened, I added the fish to the pan. Umm, yeah, try not to crowd the pan like so. It was a simple matter of waiting until the fish cooked. I believe I may have turned them once during cooking. We garnished with some cilantro because we're just a cilantro kind of people. This was quite a hit at Dear Niece's party! The caramel sauce was neither fishy nor sweet (for something that was made from the combination of fish sauce and sugar). It had a great depth to it from the caramelized sugar. Yet, it was actually quite delicate and the flavour of the trout came through and shone. Andrea of Viet World Kitchen has more information on Vietnamese caramel sauce. That looks fantastic. 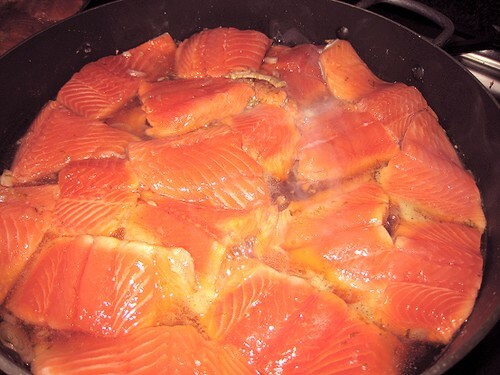 I thought it was salmon from the color, but I see its trout. Salmon would great too.Im sure it was a hit! I remember Dale from Top Chef had to go home because of attempting to make this caramel sauce. I had no idea there's a recipe for it in Bittman's book. Time to pull it out of the storage bin. I've never heard of this sauce, but it sounds great. And, the ingredients are staples so it can be whipped up anytime. I'm sure it would be great with many different things. 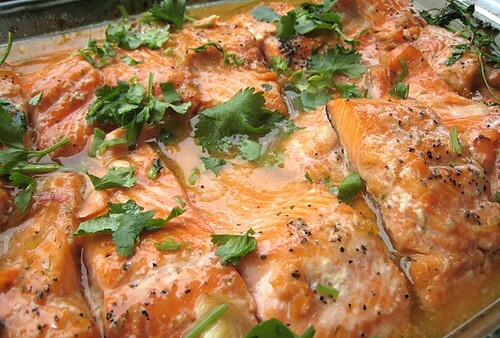 now I know how to cook my salmon with Vietnamese sauce!! your trout look really good!!yum-yum!! That Vietnamese Caramel sauce is so versatile too! I've used it with so many different meats and everything tastes so good with it! Lovely looking trout! You know how elite sports-people visualize their moves before competition? I'm already seeing this with just a squeeze of lime, picked up on a fork, and heading towards my mouth! Yum! This does look good - although, I'm not sure about such a sweet/savory combo. I'd try it though - but I'd do some pan seared action. I'd do the caramel, but probably foam it and use that as either a drizzle or the base in which I'd sit the fish on. But, yours looked good. And yes - cilantro is always in order. Can I join your cilantro club? Wow!! It's another hit. I'm gonna try that with the wild salmon fillet I bought from Save-on Foods. It is so simple yet so yummy!! Filipino "Humba" is very similar to Vietnamese Porc au Caramel. 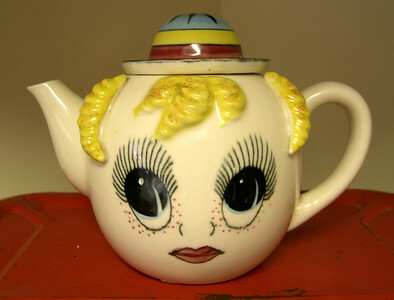 Some cooks will caramelize the sugar first instead of merely adding it. Bookmarked! 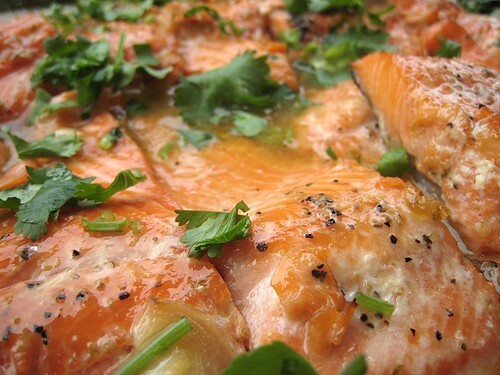 That salmon looks so good and the caramel sauce sounds really tasty! Beautiful, I mean it sounds amazing! Just amazing. This sauce sounds soooo good! Interesting. There are several French sauces for duck that start with a caramel also, i'm curious about trying this one with the nam pla. Sounds really good. You should try making this with catfish. That's the traditional fish for ca kho to. :) Much, much better than trout or salmon. I've made it with tuna filets too. Amazing - sounds so delicious. What a great way to prepare salmon. Vietnamese caramel sauce is my favorite! This reminds me that I haven't made it in a while. And I think I've only made it with pork! I'm a cilantro gal myself! Just the name of this dish is drool-worthy. Definitely going on my 'to-make' list! I thought it was salmon too. I love the thought of caramel in this dish. YUM! wow, that looks so good! i'm definitely going to try this soon. That sounds really nice, I am often delivered a whole trout by my fishing brother in law, but it is usually smoked. Next time I shall ask for the uncooked fish to give this a go! I have just made something similar to this. I used salmon instead of trout and I also added shrimp, eggs, and some broccolini. I have took some pictures. They are posted on my facebook. For some reason almost all of the trout I see here are pink-fleshed! Oh no, we haven't seen the end yet! Hahaha... We get the show via FoodNetwork Canada. Too bad he didn't win! Supposedly, you don't even have to use fish or seafood. Any kind of protein would work w the sauce.